Sauté the 1/4 cup onion and garlic in 1 tablespoon of the olive oil until lightly browned. Put into a sauce pot. Add tomato paste, water, tomatoes, bay leaf and 1/4 teaspoon of the salt. Bring the mixture to a boil; reduce heat to low and simmer. Meanwhile, heat another tablespoon oil in the skillet. Add the 1/2 cup onion; cook, stirring occasionally, until soft. Combine the onion, remaining 1 teaspoon salt, beef and next 5 ingredients. Shape meat mixture into bite-size balls. Heat the remaining oil in the skillet. Brown the meat balls in the oil, turning often to brown evenly. Add browned meatballs to the sauce. Cook sauce with meat balls 3/4 hour longer or until sauce has thickened and meat balls are cooked. Stir sauce occasionally. Arrange spaghetti on a platter. 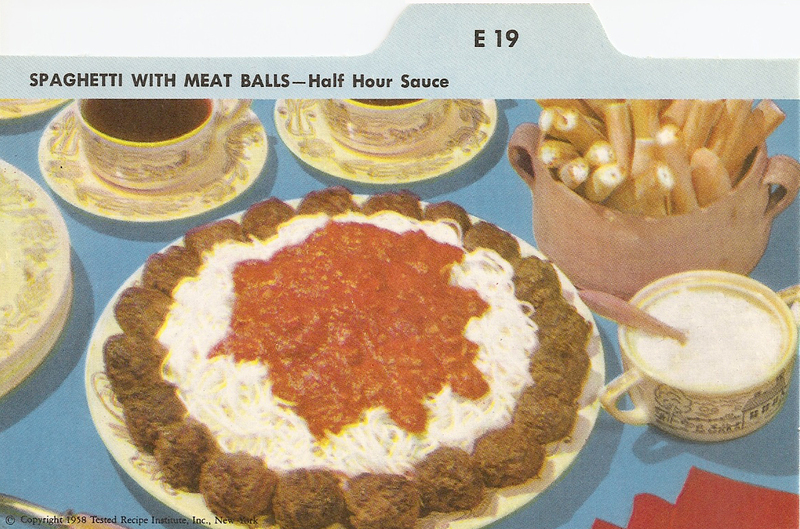 Spoon sauce over it and arrange meat balls around outer edge of platter. Serve with grated Parmesan cheese. Makes 8-10 servings. Mince 1 garlic clove and chop 1 medium onion; brown in 2 Tbsp. olive oil. Add contents of 2 cans (8 oz. ea.) tomato sauce, 3/4 cup water, 1/2 tsp. oregano. Simmer sauce over low heat, stirring occasionally, about 30 minutes. Makes about 1 cup. Thank You. Thank You & Thank You, My very Favorite recipe for Spaghetti Sauce!